How does the human body move when interacting with artificial intelligence technologies? This is the question that my collaborator Carly Lave embarks on a year-long Fulbright grant to research. A talented dancer, choreographer, and scholar, Carly will present her research findings in visual form via a self-choreographed dance solo performance. I approached her to collaborate on a photography series informed by her research goals and artistry as a dancer. We explored several visual themes, each related to the timely question of how we humans will be transformed by increasing immersion into advanced technologies, including virtual reality, robotics, and interconnectivity. To complete this ongoing project, we will continue to collaborate across two continents during Carly’s research fellowship. Stay tuned! In the meantime, I’d like to share a few early images from this work-in-process along with some words about how they were made. It can be tricky to imagine a visual concept and realize it via photography, and all the more challenging when the concept is abstract like the ones Carly and I selected. I’ll present four of our initial concepts, each illustrated with an image and a description of the techniques required to execute it. Virtual Reality Motion Study: Virtual meets reality as Carly’s body floats through the physical world while her motion is informed by her interactions with the virtual world playing inside her headset. This concept sounds simple but is quite difficult to execute photographically. We wanted to capture Carly’s physical motion in the real world as she reacts to the experience of the VR world. Images like these require a long time exposure (here about 15 seconds), which in turn necessitates shooting in a darkened photography studio. I used a black backdrop and continuous LED lighting to illuminate Carly as she moved across the studio, with a single studio strobe light at the front right part of the set to capture her final pose at the end of the exposure. The strobe was set to trigger as the camera’s shutter closed at the end of each shot (“rear curtain sync”). Using this technique, Carly’s motion can be traced during the whole exposure but the vivid exposure is what we see last. Considerable post-processing is then required to clean up the scene. Interconnectivity: Carly shared, “I found myself visualizing my body wrapped in cables coiled around my limbs and torso. I was thinking about the body in relation to embedded systems here, and how now all of our world is connected through cables either in the air or sea.” To shoot this visual concept, we used a dance studio with a mirrored wall. Using different angles to obtain a variety of perspectives, I shot both Carly and her reflection as she improvised motion along the wall. The technique conveys the impression of the interconnectedness between a human and a similar being across a network. Post-processing was required to remove clutter and render the background as white. Human (de-)Evolution Series: A whimsical re-imagining of the classic ape-to-human evolution series, this montage asks us to consider whether technology contributes to or detracts from human evolution. This striking montage is actually quite straightforward to execute. In a photography studio against a black backdrop, I shot images of Carly in each stage of the evolution series and then combined them using layers in Photoshop. Robotic Motion: Machines often perform the same tasks traditionally undertaken by humans, but the robot’s motion is constrained by its programming. How might the human dancer’s motion become similarly constrained if her movement is choreographed by programming instructions? For this concept, my job was fairly easy and Carly had to do the heavy lifting. 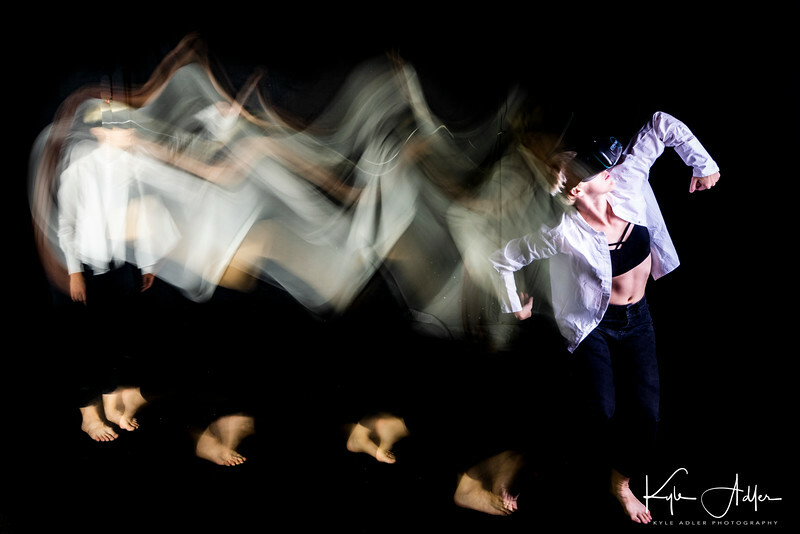 She choreographed movement indicative of robotic motion while I captured a series of images using a studio strobe light and a black fabric backdrop. I hope this behind-the-scenes peek at my ongoing passion project will help inspire your own creative process. It’s important to be personally and deeply invested in a project before you begin. Select your partner(s) carefully and plan thoroughly. Then the process becomes joyful and exhilarating as you begin to bring your concept to life! Have you carried out a photography project? Please share your key learnings–positive and otherwise–here! Want to read more posts about what to photography while traveling or near home? Find them all here: Posts about What to Shoot. The Holy Grail for us travel photographers would be to have a tiny and affordable cellphone-sized camera that can capture images with the quality and versatility found today only in large, heavy, and expensive digital cameras (DSLRs and medium- to large-format cameras). A new company called Light promises to offer just such a device starting sometime in 2018. Reading their pitch in IEEE’s newsletter for this innovative camera design, I was excited by the revolutionary concept but not convinced that their first offering would truly meet travel photographers’ needs. Take a look at the prototype photo and the IEEE article, and then we’ll discuss the bottom line. My take on Light’s pitch is that they have an exciting new design concept which someday could translate into a truly remarkable product. The idea of combining multiple cheap camera systems, each with a cellphone camera’s small plastic fixed-aperture lens and tiny inexpensive sensor, and then combining their data using controlling mirrors and software into a single high-resolution image with control over such elements as focal length, depth-of-field, and bokeh effects, is creative and compelling. By combining the separate power from all of these small cheap lenses and sensors, none of which by itself can gather much light, capture high resolution, nor provide manual control over focal length or aperture, the device and its software can achieve a final image that will be brighter, more detailed, and more controllable than the sum of its parts. But given how little the sum of its parts costs to produce, this next-gen technology carries a hefty early-adopter premium when priced at $1699. For that money, one could buy an enthusiast DSLR system (body and a couple of zoom lenses) with similar resolution and a greater range of focal lengths than the Light camera will have. But there are many other serious advantages to a DSLR or a good advanced mirrorless ILC system than just resolution and focal length. Even if the Light device’s software can generate a final processed image that overcomes each lens and sensor’s weaknesses to rival a DSLR’s image in terms of brightness and image quality (and I have real reservations about its ability to do so), it still won’t likely be able to match a DSLR’s power-up time (the time from when you turn it on until it is ready to shoot), capture frame rate (the speed at which it can capture multiple shots), or bright optical viewfinder. In summary, I like the concept and believe it could hold the key to building a future breed of travel cameras that are smaller, lighter, and cheaper than today’s “serious” cameras while retaining much of their quality. But the initial device’s high price and design trade-offs won’t leapfrog the advantages of a good DSLR or mirrorless camera just yet. The first offering would be fun to play with, in the spirit of “the best camera is the one you have with you,” but it won’t get me to leave my DSLR system at home. This will be a fun technology and a fun company to watch, though. I’ll provide updates in future posts as I learn of new information. 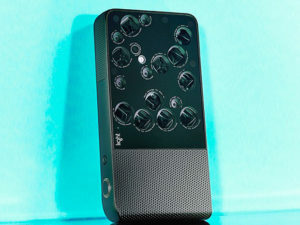 What do you think of Light’s new camera concept? Do you see this design as the basis for a new generation devices that would replace your DSLR or mirrorless camera system? Please share your thoughts here. Want to read more posts about photography gear? Find them all here: Posts on Gear.